Welds are often given a Post Weld Heat Treatment. (PWHT) There are various reasons for this, and various methods of applying this post weld heat treatment. There are also certain risks associated with PWHT. In this web page we will explore the use of PWHT. Firstly we will look at different types of heat treatment, and then we will correlate them with the welding operation. Two different materials, when subjected to the same thermal cycle, can potentially have significantly different results on the materials. Heat treatments are therefore generally described in terms of the effect that they will have on the material, rather than the thermal cycle. There are however exceptions to this rule. Post Weld Heat Treatment (PWHT) Set-Up on Pipe: The white is the ceramic blanket insulation to keep the heat in. The thin wires are the thermocouple attachments wires. The thicker plugs are for supplying current to the electrical resistance heaters. Annealing: This generally refers to the treatment that is required to get a material to a soft and unstressed condition. For most materials, such as carbon steels, this will mean taking the temperature up very high, and then cooling it down very slowly to room temperature. Quench Anneal: Here the intention is to again achieve a “soft” structure, but a slow cool would be detrimental to the material. Typical of this would be the 300 series stainless steels. (Also called austenitic stainless steels.) These stainless steels do not undergo any significant phase transformations in the bulk of the material during the heat treatment cycle, but can result in the formation of locally detrimental phases or particles when it is kept in some intermediate temperature ranges for extended time periods. To prevent this from happening, the material is cooled rapidly (quenched) from the high temperature. (Typically 1050°C) This reduces the time that the material will remain in the temperature range of 500 – 850°C, where they can experience the formation of grain boundary carbides which seriously reduces the corrosion resistance of the material. This detrimental process is called sensitization. Solution Treatment: The main intent of this heat treatment is to make sure that all the different alloying elements are evenly dispersed throughout the material, and “dissolved” within the material as far as possible. This is often performed on castings, because the solidification process during casting tends to result in the material having relatively large differences in certain alloying elements in different parts of the structure. There tends to be areas of high concentration of certain elements and low concentrations of other elements. By increasing the temperature to a point where a lot of diffusion takes place, these uneven concentrations of alloying elements will even out. Certain phases (e.g. carbides) will also be “dissolved” (go into solution) by the material at these high temperatures. To retain as much of the alloying elements in solution, some materials are typically quenched after the solution treatment. This is then very much the same as the quench anneal discussed above. Quench Hardening: To achieve high hardness in some material such as carbon steels, and low alloy steels, the material can be heated to a temperature above which phase transformations occur in the material. (Typically 950°C for carbon steels.) The material is then rapidly cooled (quenched) to form some meta-stable phases (for instance Martensite) that results in a high hardness level in the material. When materials are quench hardened, they are also typically brittle. Tempering: To soften a material that has already been hardened through a previous heat cycle (e.g. quench hardening) you can again increase the temperature of the material to a point below which it starts to experience bulk phase transformations, (Typically heated to 650 – 700°C) and keeping it there for a period of time. During this tempering cycle, the hardened martensite turns to a tempered martensite that is not as hard and brittle as the quenched martensite, but is still very strong and tough. Quench and Temper: This is a combination of the two heat treatment cycles described above. Normalizing: This is normally performed on carbon steels to provide a stress free, fine grained structure. This is achieved by taking the temperature above the temperature at which phase transformation occur in the bulk of the material, (Typically temperatures of around 950°C) and then allowing it to cool in still air. By applying this treatment to ordinary carbon / carbon manganese steels, they will develop a structure that is a very good compromise of strength and toughness. This is a very typical heat treatment applied to steel castings, forgings and other steels to achieve a fine grained structure. Thermo-Mechanically Controlled Process: (TMCP) This is not strictly speaking a heat treatment as such, but I think this is a good place to discuss it shortly. In the TMCP, a steel is deformed (e.g. undergoes rolling) while simultaneously experiencing temperatures that are not high enough to cause total phase transformations and recrystallization, but not so low that it will result purely in cold forming. Every steel mill tends to have their own sequence of temperatures and deformation to obtain a strong material that is easy to weld. TMCP steels tend to have low carbon equivalents, while still being very strong and tough. There are some other more specialized heat treatments that are sometimes employed under very special circumstances, but for our purposes, those listed above would be the main heat treatments to take note of. In some instances, components close to welds undergoing post weld heat treatment (PWHT) need to be protected from the heat. This can be done with cooling jackets. This photo shows such a cooling jacket set up next to a weld to be post weld heat treated. Fusion welding is associated with temperatures high enough to melt the materials being joined. As such, they introduce a thermal cycle that will result in the materials close to the weld being heated to temperatures close to the melting point, and the materials far away from the weld seeing hardly any increase in temperature. In other words, there is a thermal gradient experienced by the materials that span all the way from ambient to melting temperature. The part of the base metal that has had its structure changed by the welding heat is known as the Heat Affected Zone (HAZ) of the weld. The material where the temperature was not high enough to make any significant difference to the material is simply called the base material. The section that was melted due to the welding operation is termed the weld metal. The weld metal structure is going to be a function of the base metal compositions, the filler metal composition and the effects caused by the thermal cycle. As a general rule we can choose the filler metal to give the desired results within the weld metal. We can however not do anything, in terms of the composition, to the heat affected zone. (HAZ) The only effect we have in controlling the structure of the HAZ is to control the thermal cycle. When it is subsequently cooled down, there will again be phase transformations. If the cooling rate is rapid enough, then we may experience some amount of quench hardening in this region, resulting in a hard brittle structure. If the cooling is slow enough, then we will experience a thermal cycle similar to a normalizing heat treatment. If the cooling rate is very slow, then the thermal cycle will resemble that of the annealing cycle for the steel. This means that by changing the amount of energy used when welding, (also called the heat input) along with pre-heats and post-heats, different structures can be achieved in both the weld metal and the HAZ of the weld. Some materials, such as low alloy steels, almost always result in a quench hardened structure within the HAZ when welded. They then need a further Post Weld Heat Treatment (PWHT) to achieve the desired result. In the case of our example of a low alloy steel, they almost always need a tempering treatment to achieve a suitable strong and tough microstructure. Some materials achieve a significant amount of their strength from cold working. Cold working just refers to deforming the metal plastically at a temperature below which the deformed grains of the metal will recrystallize. This treatment results in an increase in strength of the cold worked material. When welding a cold worked (also called work hardened) material, a section of the HAZ will experience temperatures high enough to cause recrystallization and phase changes. This will eliminate the cold work, and potentially reduce the strength of the material in the HAZ significantly. Please note that no post weld heat treatment can reverse this effect. This softening is often experienced when welding work hardened aluminum alloys. The HAZ will always be significantly weaker than the cold worked parent metal. The only way to effectively deal with this effect is to design the component in such a way that the weld is placed in a region of lower stress, or the base metal is made thicker than required around the weld area, to compensate for the loss of strength. The other way that aluminum alloys are typically strengthened, is through precipitation hardening. Again, the welding thermal cycle will introduce an area into the HAZ that is unaged, (Temperature was high enough to return precipitates into solution, followed by a quench due to the high cooling rates typically associated with welding.) and an area that is over aged. (Temperature was higher than required for optimum aging, but not high enough for returning precipitates into solution.) Thus welding of precipitation hardened (also called aged) materials will result in reduced strength of the HAZ. For small components, it may be possible to subject the entire component to a precipitation hardening cycle, but under most circumstances, there is usually nothing that can be done to remedy this reduced strength in the HAZ of a precipitation hardened material. Welds in high strength Aluminium alloys generally result in reduced strength in the weld heat affected zones. 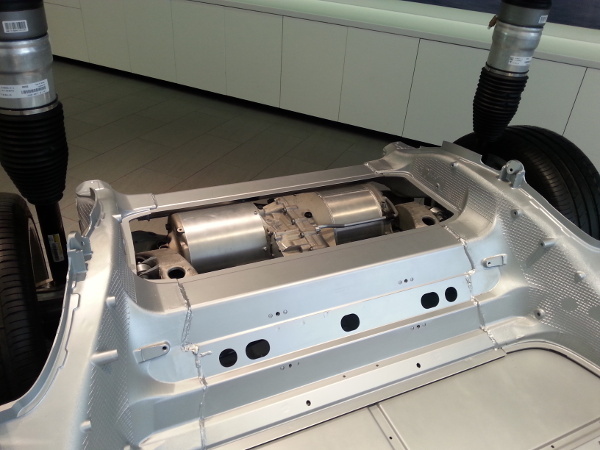 (HAZ) In this Aluminium car chassis, this is compensated for in design, by placing the welds (not very pretty welds I may add) in lower stressed areas. Stress Relieve: Welding introduces high residual stresses into metals in the region around the weld. This can result in reduced fracture toughness properties, and susceptibility to corrosion mechanisms such as Stress Corrosion Cracking. (SCC) The stress relieve is probably the most often performed post weld heat treatment, particularly on carbon steels and carbon manganese steels. Stress relieve is normally a code requirement for pressure equipment above a certain thickness. (Each code has different rules for determining when a stress relieve is required.) For carbon steels, the stress relieve is typically around 580°C – 650°C. Please note that a stress relieve treatment at the higher end of the range could reduce the strength of a TMCP steel. When post weld heat treatment is required for TMCP steels, it should preferably be done at the lower end of the range. Temper: For low alloy steels, and other materials that naturally harden when welded, a temper is almost always required. Tempering temperatures can vary widely, but for low alloy steels is typically around 700°C – 750°C. (Some quenched and tempered micro alloyed steels can have significantly lower tempering temperatures.) Please note that using a post weld heat treatment tempering temperature above that of the base metal will weaken the base metal. Post weld heat treatment tempering is therefore recommended to be around 30°C lower than the temper of the base metal. Normalizing: Most large and complex shaped structures cannot be subjected to a normalizing PWHT. The reason being that the material becomes so weak at the soak temperature (Typically 950°C for carbon steels.) that it cannot support the structure, and results in catastrophic buckling and distortion. A normalizing post weld heat treatment is therefore only performed on rather simple components that can be easily supported. 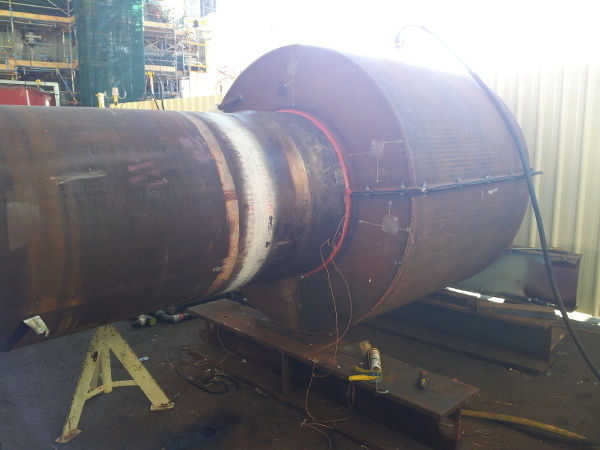 A typical example may be a welded dished end for a pressure vessel, before it is welded onto the vessel itself. Post Weld Heat Treatment (PWHT) is not without risk. Below is a list of potential problems that can be experienced when performing post weld heat treatment. Loss of strength: Excessive times, or too high a temperature for a stress relieve post weld heat treatment can result in a reduced strength of the material. Tempering treatments can also result in reduced strengths for quenched and tempered materials. Times and temperatures therefore need to be well controlled. Distortion or collapse: The stress relieve or tempering temperatures result in a material that is significantly lower strength while at the elevated temperatures. If a structural component is experiencing some load on it, then during the post weld heat treatment cycle it could buckle or distort. This could have catastrophic and high cost consequences. It is therefore important to make sure that all structures being exposed to high temperatures are properly supported. In addition, if one section of the structure experiences significantly higher temperatures than other sections, the difference in thermal expansions can also result in severe distortions of the structure. This situation is typically experienced when shell and tube heat exchangers are subjected to a stress relieve post weld heat treatment where the shell temperature is increased and decreased in temperature much faster than the tubes. It is important to make sure that there are no excessive temperature gradients or differences during a post weld heat treatment operation. To ensure this, there should be enough thermocouples attached to the components to ensure that unacceptable temperature gradients do not occur. 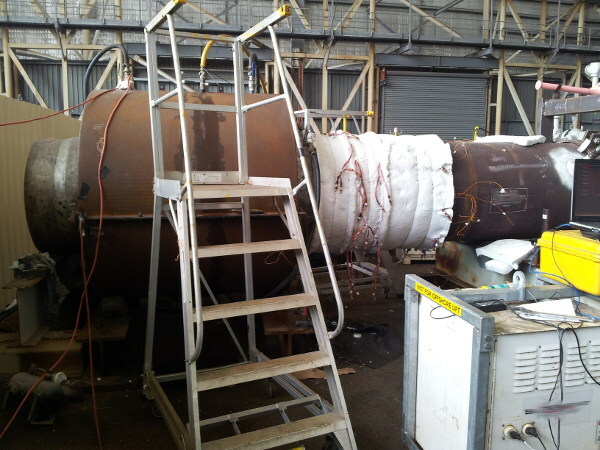 In some furnaces, there could also be potential flame impingement on some local spots on the vessel. This could locally increase the temperature to values above the phase transformation temperature, (lower critical temperature) resulting in unexpected phase changes and also volume changes. These have the potential to not only reduce the mechanical properties, but also to lead to distortion. To prevent this, there should be furnace loading sketches showing how flame impingement will be prevented, and there should also be thermocouples placed on the locations closest to the burners of gas or oil fired furnaces. Furnace: In furnace post weld heat treatment, the entire component is typically placed within a furnace and the temperature cycle applied to the whole component. Obviously this means that the component or structure must not be so large that it does not fit into a furnace. Also, the component must be moved to where the furnace is located. For maintenance work, or for long unwieldy shaped components, this is often impractical. The main advantage of this type of post weld heat treatment is that variable expansion caused by excessive thermal gradients (different temperatures in different parts of the component) can be kept to a minimum. To do this, the heating and cooling rates are important, as thicker sections will tend to take longer to heat or cool than thinner sections. Internal Firing: In this method, the component is insulated on the outside, and heat is introduced to the inside of the component, until the entire component is heated to the required temperature. The heat is typically introduced by gas fired burners. Obviously this is only suitable for “hollow” type components such as pressure vessels. It is also quite an expensive option, with risks associated with suitable insulation and flame impingement from the burners. Locally Applied External Heating: This method of post weld heat treatment is suited to elongated components that only need the heat applied at local areas, rather than the entire component. This is typical on circumferential welds on piping, or closure welds on long pressure vessels. In this method, some kind of element introduces the heat into the outside of the component, (sometimes elements are placed on the inside and outside to assist with even heating) usually in a band around the full circumference of the component. Suitable insulation keeps the heat from being lost from the surface through convection and radiation. Heat is however lost through conduction to the unheated sections of the component. It is therefore important to control the thermal gradients from the area experiencing the PWHT to the areas that are still “cold”. If this is not done carefully, the variable thermal expansion can actually introduce residual stresses in the areas adjacent to the area being post weld heat treated, which can just move the problem from one location to another. Gas or Oil Burners: These are normally used in larger furnaces, or when performing internal firing of a component. The main issue with this is that the burners could potentially impinge on the components, resulting in “hot spots” where the temperature is too high compared with the rest of the component. The furnace lay-out must therefore be carefully planned to make sure that this does not happen. As a general rule, additional thermocouples will be applied in the areas where flame impingement is possible during the post weld heat treatment. Electrical Resistance Heating Elements: These are often used for the local post weld heat treatment of components. They take the form of mats that have the electrical resistance wires “woven” through ceramic beads. These “heat beads” are then attached to the surface to be subjected to post weld heat treatment. Often they are simply kept in place by use of steel wire. When using these heating elements, the elements are placed against the surface of the metal, and insulation is applied around the outside, to keep the heat in. Induction Heating: In this heat source, an element (often just a cable wrapped around the pipe) has a high frequency alternating electrical current passing through it. This alternating current results in a magnetic field around the element. The magnetic field in turn results in eddy currents in the metal. The eddy currents then result in resistive heating in the metal. In essence, the metal being subjected to post weld heat treatment is actually the heating element. (This works in much the same way as induction heating hot plates for preparing food.) This heat source has a number of advantages. The first is that it can normally result in much faster heating than the use of burners or electrical resistance heaters. The second advantage is that the heating coils can be applied around the outside of the insulation that is placed against the metal to keep the heat in. This means that the elements are not exposed to the high temperatures, so the system is more robust. The third advantage is that this system is generally more energy efficient than the electrical resistance heating method. There are also some disadvantages. The first is that the high magnetic fields can mess around with some instrumentation, and there is also some concern regarding the long term safety aspects. If you have a heart pacemaker, you would likely not want to hang around this type of equipment when it is operating. The other disadvantage is that if something goes wrong with the control, then it would be much easier for the material to be severely overheated before the operator realizes that the system is out of control. This can be mitigated by ensuring that there are enough “spare” thermocouples, as the problem mostly arises when control thermocouples get dislodged from the component. As a general rule, the fabrication codes dictate when post weld heat treatment is required, and the particular post weld heat treatment cycle. They also generally state the requirements in terms of the methods that can be used, and the maximum heating and cooling rates and the maximum thermal gradients that are allowable. Examples of such codes would be ASME VIII, BS 5500 or AS 4458 for pressure vessels and ASME B31.3 or AS 4458 for piping. There are also other guideline and recommended practice documents that assist in assuring that the post weld heat treatment is performed correctly. A widely used document in this regard is AWS D1.10, which is a recommended practice for local post weld heat treatment of piping. Post Weld Heat Treatment (PWHT) is a specialist area in itself, with many technicians specializing in operating post weld heat treatment equipment and furnaces. If you are interested in getting into this kind of work, then get hold of a company in your area that does this type of work and see if they can offer you a job. Most of the time, these companies will also provide you with the necessary training to operate their specific equipment. Another technical issue revolves around comparing different PWHT cycles. As this is a bit of a technically detailed subject, I have addressed it in a web page of its own. Click here to see how different heat treatment cycles can be compared.